It’s Wednesday Briefs time and another look into quaint little Blue Crab Cove, Maryland. This time I used “tornado” as a prompt for the story. And yes, it falls nicely within the word count. I hope you enjoy Officer Lindsey Anderson’s latest adventure! Lighting cracked like a ringmaster’s whip, the strike much too close to my house. I couldn’t help but jump as the lights flickered. This was going to be a miserable evening for anything, but especially work. The rain pounded down in dense sheets. I knew I’d be drenched before I even got into my police car. My poor orange tabby, Murph, was hiding under my bed, wedged between boxes. That cat had the best ears of any feline I’d ever had. He ran for shelter at the first hint of a thunderstorm. With the way today’s storm raged outside, I’d rather be in hiding, too. At least I didn’t have to worry about a tornado. We didn’t get too many of them in Maryland. It’s been such a long time since I’ve had the time and desire to write creatively. With grad school over for now, I’m getting back to flashing and Wednesday Briefs. Woohoo! As a refresh, Wednesday brief stories are based on a prompt and must range from 500 to 1000 words. Several authors take part…be sure to check out the links to their stories. My story this week is based on a picture of a road, shrouded in fog. I’d like to start writing a new novella based on the location and characters in this week’s story. I hope you like the peek into Blue Crab Cove, Maryland. My patrol car gleamed in the morning sunlight. I’d gotten up early to wash and polish every possible surface. Today, I was the lead car in Blue Crab Cove’s annual Memorial Day parade. This was an honor I didn’t take lightly. My father had served in the Navy prior to joining the Oregon State Police. Thinking of him, I paused in mid-swipe, allowing myself a short prayer. Dad had been killed in the line of duty almost five years ago. Holidays like these were still tough for me, but I was determined to pay my respects to all who’d served and paid the ultimate price. I nodded. Tears pricked my eyes, and I didn’t trust my voice to come out sure and strong. Looking down the creek toward Market Street. 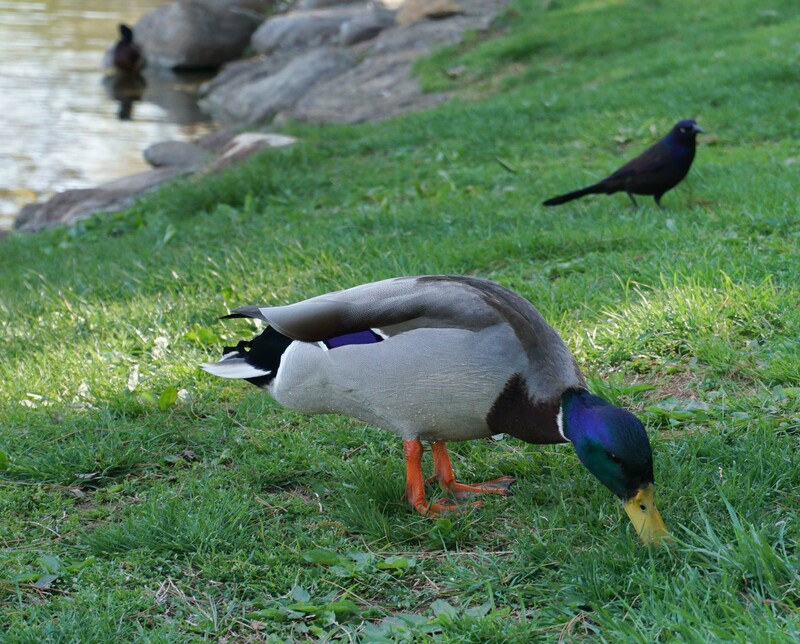 A mallard hunting for something good to eat.